When people eat ordinary table sugar, called sucrose, the body digests it into fructose and glucose. Glucose is a simple sugar that the body uses to provide the cells with energy. The body normally protects itself from the damaging effects of high glucose levels by neutralizing the glucose it does not need. Insulin is the main substance used to keep blood glucose levels from becoming too high, but people who have diabetes might either have a resistance to the effects of insulin or might not produce insulin at all. This is how diabetes and glucose are related. There are two types of diabetes, type 1 and type 2. In type 1 diabetes, the sufferer does not produce insulin at all. People who have type 2 diabetes do produce insulin, but their bodies do not respond to it as well as a healthy body would. In either type, the relationship between diabetes and glucose is direct. Untreated diabetes causes blood sugar to rise to unhealthy levels. Diabetes and glucose levels can be controlled by diet, exercise or medication. The mode of control depends on the severity and type of the disease. People who have type 1 diabetes always have to take insulin because their bodies simply do not produce it. Control of type 2 diabetes might never involve the use of insulin treatment if the patient is compliant with prescribed medication and lifestyle modification. There is a direct correlation between diabetes and glucose tolerance. Glucose tolerance is sometimes tested as part of the process of diabetes diagnosis. The patient drinks a solution of sugar and water right after having his or her blood sugar level tested. Blood sugar is tested two to three hours after drinking the solution. A blood sugar level of 99 to 199 might indicate prediabetes, and levels of 200 and above call for a clear diagnosis of diabetes. Another test for diabetes involves checking the blood glucose level after the patient has been fasting for at least eight hours. If the level is high enough to arouse suspicion, the practitioner might perform the same test on another day to confirm the diagnosis. Further testing and medical history helps determine the type of diabetes, which will in turn determine the course of treatment. Hemoglobin A1C is a test that indicates average blood glucose levels over the three months prior to taking the test. Most practitioners use hemoglobin A1C to determine how effective the current treatment is in keeping diabetes and glucose under control. Patients should take this test several times a year to be sure that the prescribed treatment is still working. 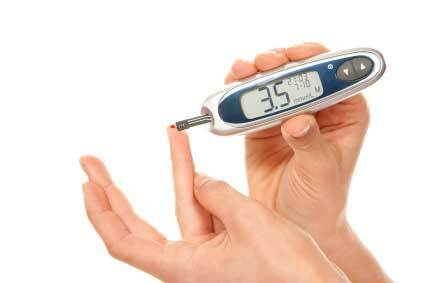 By diabetesdoctors in What Is the Relationship Between Diabetes and Glucose on December 10, 2012 .